There are hundreds, if not thousands of types of agates. They are found around the world. The world of agates is a fascinating and ever evolving places Sometimes agates are named because of their formation type. In other cases, they are named after the location in which they are found. They bring a wonder and magic to the planet with their swirls of color bands. We have captured the metaphysical properties of several of the most popular ones examples. 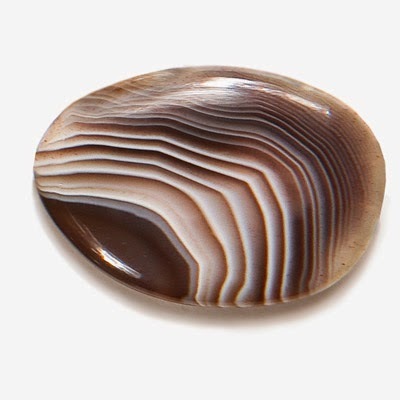 Often called the “earth rainbow”, Banded Agate is a healing stone for body, mind and spirit. It can increase concentration, honesty and memory. Banded Agate also protects the wearer from psychic attack, thereby preventing negative energy from harming you. Physically, Banded Agate increases stamina, helps with digestive conditions and protects the body from harmful radiation from X-rays. Agate is formed with bands of microscopic quartz crystals. It is a variety of Chalcedony. Agate is a grounding stone as well as a spiritual stone, allowing for one to bring their spiritual experiences into their everyday reality. Agate is believed to improve mental functions and can help where issues of clarity and stability are concerned. Agate is also helpful in overcoming negative emotions by bringing love into the chakras. Although they work very slowly and deliberately, this gentle nature of Agate helps it to have a lasting impact. 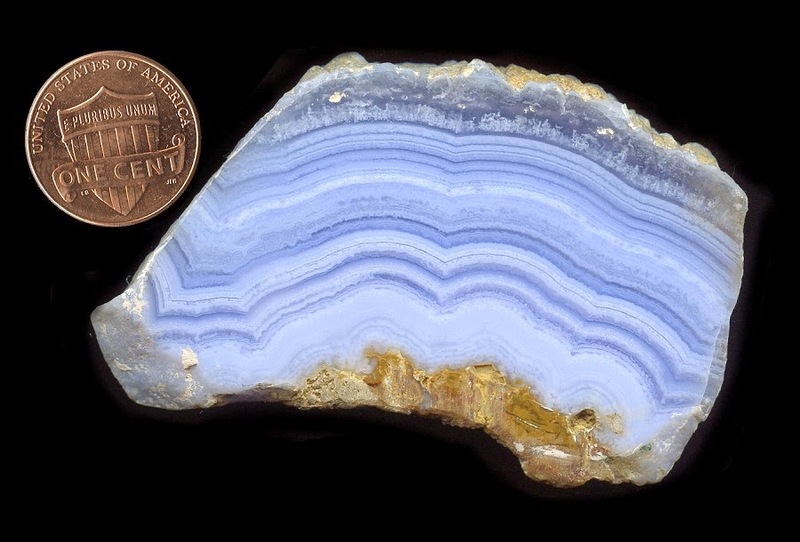 Brazilian Agate is formed from microscopic crystals of quartz laid down in bands. This is a very stable crystal. Agates are grounding stones, bringing about an emotional, physical, and intellectual balance. They aid in centering and stabilizing physical energy. Agate has the power to harmonize yin and yang, the positive and negative forces that hold the universe in place. A soothing and calming stone, agate works slowly but brings great strength. Its multiple layers can bring hidden information to light. This mineral can be used to activate success in dowsing and in divining. Fastened with twine or leather upon the end of a willow, it has led the user to lost items. Brazilian agate can be used to facilitate immense strength, to assist one in diversification in fields of endeavor, and to promote meditative states and astral projection. Brazilian minerals such as Brazilian Agate are known for balancing the four energies: physical, mental, emotional and spiritual. It does this by cleansing and stabilizing the “aura”. The net result is improved strength, courage, pragmatism, calmness and critical thinking ability, as well as better concentration, more confidence and an overall feeling of composure. Physically, it has been known to improve digestion, blood circulation and help with bruises, muscle spasms, headaches, gastric ulcers and even childbirth. 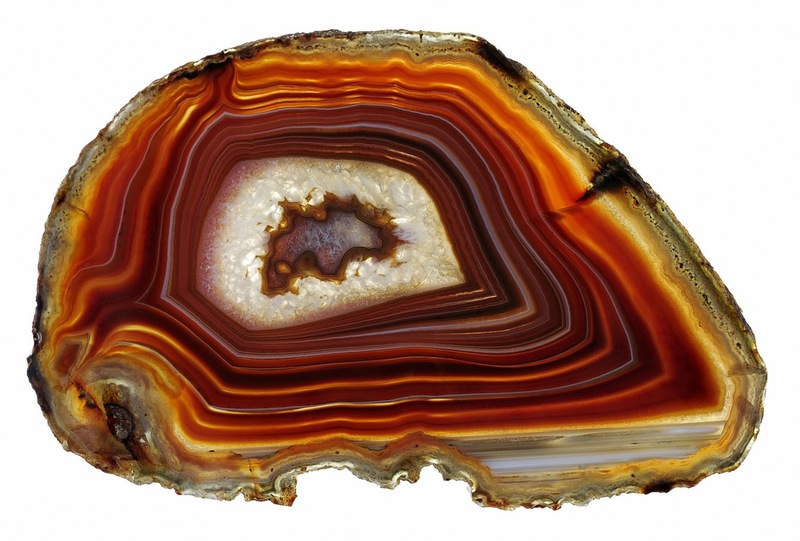 Known for its natural beauty and banded, multi-colored patterns, the history of agate shows how it was widely used throughout ancient societies for mystical healing ceremonies. Much of the Brazilian agate seen today has been found in volcanic cavities. It was formed when a mixture of saline water and gas bubbles formed within cooling lava, which explains the intricate patterns and unique designs on these stones. 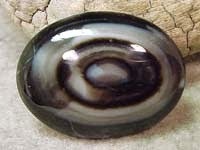 Bulls Eye Agate (also known as Orbicular Agate) has long been thought to ward off the evil-eye or curses. It helps the survival instinct, eliminating fear and helping to improve one's chances for survival in dangerous situations. It stimulates the quality of grace in physical movements and actions. Bulls Eye Agate balances the chakras and stimulates an awareness and fulfilment of well-being. It treats disorders of the reproductive system. Aids in the treatment of growths and stimulates regenerative properties. 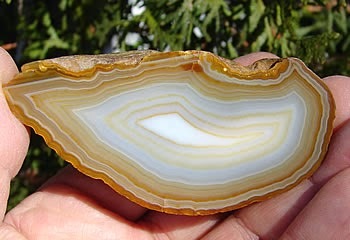 A truly beautiful and interesting agate, Bulls Eye Agate gets its name from the large and distinctive eye patterns. 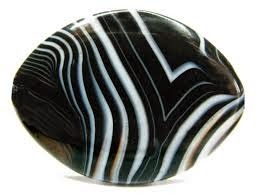 Similar to in markings to Botswana Agate, but with starker colors, i.e., more black and white. Mystical Properties: Bulls Eye Agate is found in the Badlands of South Dakota and was considered a vision quest stone by the native Indians of the area. It was sometimes given as a wedding gift, in the hope the children of the union would provide the tribe's next seer. The Eye variety of Agates has long been thought to ward off the evil-eye or curses. Thought to vibrate with the 1st Chakra governing the survival instinct, fear and all eliminations. It is therefore thought to improve one's chances for survival in dangerous situations. Regarding Agates in general, according to Edgar Cayce, one of the most famous Psychics of our day, agate is "an incense to the finer self that makes for an awakening, an opening of the inner self for the receptiveness. An attunement is made through such vibrations." Agates have long been thought magical, curing everything from thirst, the evil-eye, the bites of scorpions (Sicilian Agate), insomnia, bad dreams, intestinal troubles, skin diseases, and increase fertility (green varieties). Healing Properties: Elimination problems, constipation, excessive fear. Scientific Properties: A nice, hard gemstone, Bulls Eye Agate is composed of Chalcedony (extremely finely crystalline quartz--called "cryptocrystalline"). with various impurities. Author Michael Gienger - Healing Crystals As I love the crystal and so I keep wonderful collection of crystal related books.